WebRTC: The Next Big Thing in Cloud Communications? In a nutshell, WebRTC is a new feature to be incorporated in virtually all web browsers. It will also be leveraged in stand-alone apps where one aspect of the application is a real-time voice or video conversation using the Internet (a.k.a. VoIP). The feature is built on-top of another newish web technology called HTML5. Using HTML5 and WebRTC, applications may access available audio and video capabilities resident on the local host device without the need to install any sort of plug-in or special application. In other words, you may simply, launch the web application from a link or bookmark on your Internet connected device, and instantly make a call to your friend or a business. With WebRTC, you no longer need to install a platform dependent soft-phone application, and then deal with a complex configuration in order to make a simple call. With the support from Google and Mozilla (Firefox), WebRTC is currently available in Chrome and Firefox. Other major (and minor) browser and web application players already do or are also expected to soon support WebRTC. While WebRTC was conceived as a solution for browser to browser calls, a more versatile application is to let the browser make calls through a VoIP service with connectivity to any phone number in the world. Some service providers have built or have plans to build WebRTC-based applications to be used in conjunction with their services. What Has Obihai Technology Been Doing with WebRTC? Engineers at Obihai have been working to enhance the real-time communication software, i.e. 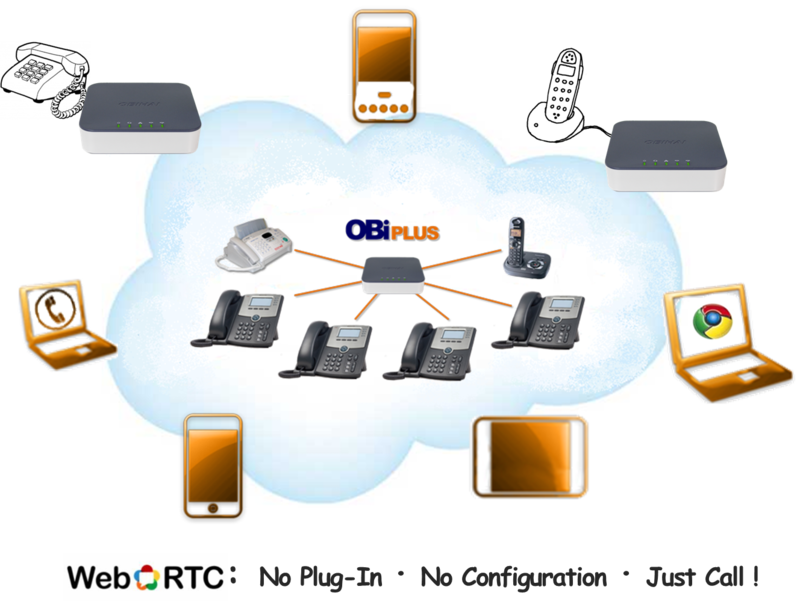 “stack” used on OBi VoIP products to make them compatible with the WebRTC standards. There are many possible applications and products that will come-about as a result of this work.